Grace Russell, at fourteen, has already had to adjust to a devastating accident from which she’ll never recover. Now she and her newly single mother are leaving their city home for Flambards, out in the Essex countryside. An exciting opportunity – but, for Grace, it’s a change too far. Yet, she finds herself increasingly interested in the house, its people (both past and present) and, especially, two boys she meets: Jamie, who is wrapped up in his own interests, and the deeply troubled Marcus, who is dealing with his difficult, potentially violent father. Over time, Grace discovers surprising links to the house and landscape she has just arrived in, and in turn, her own place in the world. 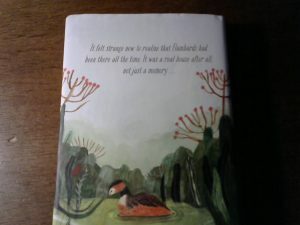 The cover by Katie Harnett is enchanting and the significance of the bike, and the grebe on the back, becomes clear as you read. I didn’t at first expect it to be set in present-day UK, but I’m so glad it is. It’s no pastiche of K. M. Peyton’s famous Flambards series – but rather a descendant with the same daredevil blood in its veins. 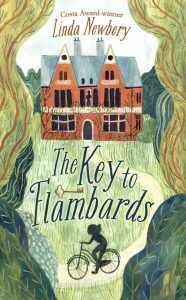 The Key to Flambards is just as suitable for fans of K. M. Peyton’s thrilling and adventurous stories as it is for those who’ve never read them. It has family right at its heart – yet there is plenty of action and drama. Horses, unsurprisingly if you know the Flambards series, do feature and nature is an integral part of the story. However, it is firmly set in the contemporary world and engages with modern issues. Perhaps that sounds preachy, but the story most definitely isn’t. There are moments where you might well cheer, worry so much you have to read on, or need a tissue if you’re anything like me. I’d recommend this novel for confident readers of secondary school age, who like books with daring young characters, nature and family. A lovely gift from someone who loved the K. M. Peyton books to a younger relative or friend, The Key to Flambards is a future classic in sympathy with its heritage. Back view of the book. This is the very best sort of fan-fiction – engaged, not derivative. The title pays off at the end. Hooray. Themes including disability and LGBTQ inform the emotional lanscape – but it’s in no way an ‘issues’ book. Such thoughtful resonance with the 1914 – 1918 Great War remembrance. One day, I’d love to be published by David Fickling Books! This entry was posted in Review and tagged #writersreviews, Flambards, K. M. Peyton, K.M. Lockwood, Linda Newbery by KMLockwood. Bookmark the permalink.